Greek band Sorrows Path deliver a latest album that is heavy, memorable, and enthralling. 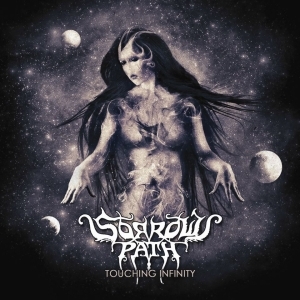 Sorrows Path may not have the widespread notoriety that other groups with the same length of existence share, but their history is audibly demonstrated throughout 'Touching Infinity'. Formed in 1993 by Takis Drakopoulos (bass) and Kostas Salomidis (guitar) in the cultural dynamo of Athens, Greece, the band released its first demo in 1995. Unfortunately, the band broke up for the years spanning between 1998 and 2005 due to a near-paralyzing motorcycle accident suffered by Kostas Salomidis. The silver lining in such a dark, clouded event, is that the band regrouped and have a marked hunger for excellence that is exacerbated by their technical proficiency. One's first impression upon listening to Sorrows Path is that they have a mature, unique sound, tempered with professional skill. This is Doom rooted in the style of Solitude Aeturnus and with hints of Candlemass, but at times the delivery instrumentally echoes that of classic Mercyful Fate in the way the songs feature so many varied tempos, riffs, and melodic ideas. The second track, 'Fantasies Will Never Die,' starts with a simple, syncopated riff that is repeated until a melodic, almost-trippy chorus arrives. At the 2:20 mark, they deliver a truly Doom-inspired breakdown which pummels the listener with an onslaught of heaviness replete with harmonic minor guitar leads over the top. 'My Chosen God,' the fourth track, begins with the bass playing high in the register over the guitar which breaks into a pinch-harmonic accented riff that conjures the style of one Andy LaRocque. The solo section is nothing short of spectacular as the guitar shreds with multiple tracks over which the bass has its own original celebration meandering over and under the guitar lines. What is conveyed is controlled chaos of the variety that could only be delivered by those who truly know their instruments' features, nuances, and capabilities. A main riff that conjures up a decidedly Oriental feeling is the basis for 'Beauty,' the seventh track. The end result is the most original song on the album if not a contender for the best. Angelos Ioannidis, the vocalist, shows off a baritone delivery on track nine, 'Revival of Feminine Grandeur' that is reminiscent of Geoff Tate's work in Queensryche. The speed picking exercised in the latter part of the song features both guitarists harmonizing, doubled by the bass, and then delivering tapping solos that launch into the many different key changes leading into the song's conclusion. Instrumentally, the band's multi-faceted skill characterizes its sound. The guitar tone is heavy yet clear, a classic Metal sound that truly benefits from having two guitarists, Kostas Salomidis and George Vichos, who each have their own distinct styles that compliment and bring out the best in each other. The drums, played by Thodoris Christodoulou, are solid, using double bass when appropriate, but always hard-hitting. The bass playing is truly over the top as Stavros Giannakos has an in-your-face tone that lends well to his active playing style which harmonizes with the other instruments and often delivers his own counter-melodies. The vocals are loud, clear, and in key. Solitude Aeturnus would be an excellent point of reference as the vocals are always tasteful and never pretentious, nor do they venture into any falsetto-laden territory. Each element is represented well by the production, though the guitars could be a bit louder and thicker. The vocals, however, are so clear that one could hear the singer swallow between lyrics! One gets a feeling when listening to Sorrows Path that echoes shades of many of the classics in Heavy Metal. While there is a decidedly Doom flavor throughout, there is also much more to their sound. The band manages to achieve its themes of light and dark through the peaks and valleys written in the songs. The songwriting is quite mature and has some hints of Prog a la Fates Warning throughout. The gloom is countered by passages of triumph and others of mystery. There is a bit of Power Metal referenced within, though it is more akin to Armored Saint than Manowar or Hammerfall. Sorrows Path is a Metal band, first and foremost, and ultimately more than just the sum of its parts for the professional level of musicianship is displayed by musicians well-versed in theory. The band benefits from the varied tempos, excellent technique, and key and stylistic changes for the end result is an offering that is edging close to classic. One gets the urge to crank the music, head-bang (or whatever motion one uses to bodily get in sync with the music) and drive fast. Hopefully more audiences will become aware of Sorrows Path for theirs is a sound that is heavy, memorable, and enthralling.